Wooden paving block | That Belongs in a Museum! What I brought for you this evening is Chicago’s connection to the horse. This is not a petrified horse turd! I acquired this from the area south of North Avenue between State Street and Dearborn where they were re-creating or restoring the alley behind the cardinal George mansion about two years ago. This is one [of the original wooden paving bricks] they had torn up and thrown away. So I picked it up. And I found out that back in the 1840s they paved as much as 480 linear miles of this. 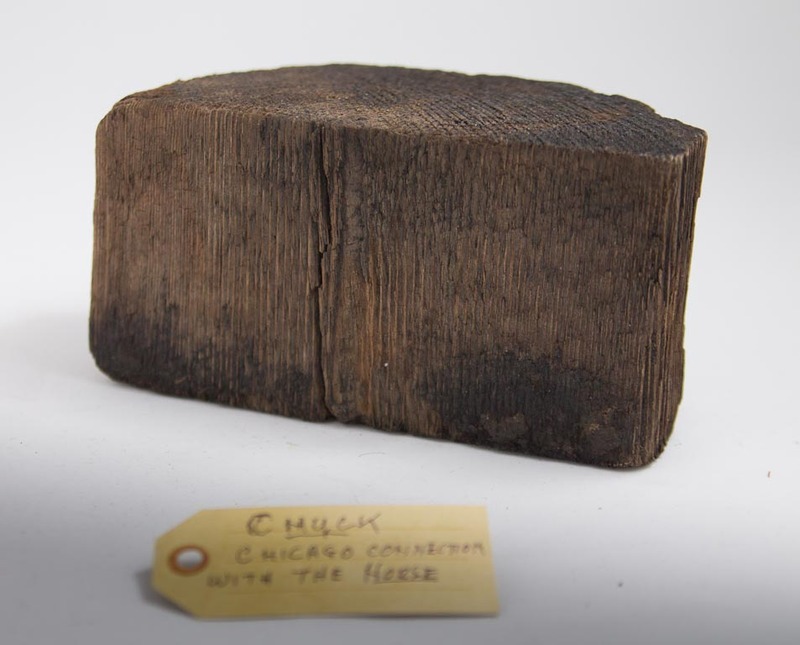 …In the upper class neighborhoods north of Madison Street they used these blocks to quiet the rumble of the horses and the wagons going by, especially in the residential neighborhoods. These streets lasted for quite a few years, in fact, there’s an alley that parallels Fullerton from Clark to Orchard that they’ve paved over with blacktop, and in places where the blacktop hasn’t adhered, usually around the perimeter, you’ll see these blocks poking through there.